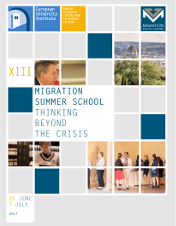 The MPC welcomes from 26 June to 7 July an enriching mix of 28 researchers, civil servants, international organizations practitioners, NGO workers, policy analysts from around the world to the XIII Migration Summer School ‘’Thinking Beyond The Crisis’’. This two-weeks Summer School will provide participants a unique opportunity to study through a variety of disciplinary approaches the main issues relating to the determinants, characteristics and implications of international migration. The combined insights from sociological, demographic, legal and economic approaches to the study of migration will enable them to return home with a deeper understanding of one of the most complex and multifaceted phenomena affecting governments and society across the globe. The Summer School is also a chance to meet researchers and practitioners from throughout the world, have access to some outstanding scholars and practitioners in the field and take advantage of the research facilities of the European University Institute (in particular the Library). Follow us on twitter @MigrPolCentre #MPCSummerSchool.